In broad strokes, religion became more important for people in East-Central Europe over the last 20 years and less important for people in Western Europe. According to the European Values Survey, church attendance jumped in Poland, Romania and Slovakia whereas it declined throughout the West. Even in places where church attendance in the east remained very low -- Bulgaria, Slovenia, Hungary -- the percentage of people who consider God important in their life -- increased over that same period. The Czech Republic, however, has remained consistently non-religious. Only 8 percent of the population attended weekly church services in 2008 (compared to 58 percent of Poles and 38 percent of Portuguese). Only 26 percent considered God important in their lives. And only 5 percent expressed confidence in churches, which put the Czech Republic below the Netherlands and Switzerland. 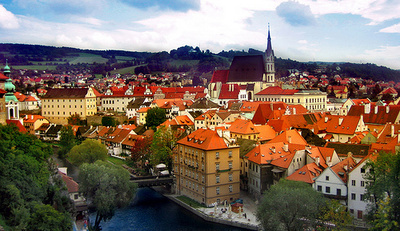 The Czech Republic often heads the list of the most secular country in Europe. "The apparent lack of interest in traditional forms of Christianity is accompanied by the massive popularity of what sociologists call 'invisible' or 'alternative' religion and what could be best described as a belief in magic," writes Dana Hamplova in The Guardian. "Czechs may not be very enthusiastic churchgoers but many of them easily accept the idea that fortune-tellers can predict the future, lucky charms bring good fortune or that the stars might influence their lives." Michael Otrisal confirmed this insight. A pastor with the Church of the Brethren, Otrisal now contributes religious programming to the main Czech television station. "We have very strong opposition to organized religion," he told me in an interview last February at the TV station in Prague. "So, we are more anticlerical than atheist. If you talk about spiritual impulses or issues here you can find a lot of ears to listen. But the Church is not something that the general public is interested in. There are various examples of strange religiosity blossoming here -- sects and funny teachings -- which are the dark side of this anti-clerical position. The people are not trained to distinguish between the fake and the real." I met Otrisal in 1990 when he was just at the point of considering a shift to journalism. He invited me to a youth meeting at his church where I listened to a guitar-playing pastor and discussions of Bible study. These days, he has brought this kind of mix of religion and entertainment to television. But it wasn't initially an easy sell -- either to the Church or to the TV executives. "The discussion with the churches was a process," he explained. "They expected that religious TV meant more Christian services. This is the core of our spiritual life, but in my opinion it doesn't really work on television. We had to struggle on both sides, with the churches and with the TV company. We were working in a crossfire. But I think we managed to convince the Church that we are not a fifth column of Church dissidents on TV, and I hope we convinced TV that we are not working here as missionaries but as Christian journalists. We're not offering an ideology but simply another perspective." We talked about the challenges of being a pastor under Communism, his involvement in the revolutionary changes in 1989, his best and worst programming moments and why he agrees with Soren Kierkegaard that when everything is Christian, nothing is Christian. In 2013, the budget deficit was down to 2.7% of GDP from 4.4% of GDP. In the next few years, the European Commission expects a trend reversal. Despite higher GDP growth rates, the Czech budget deficits will grow again. This year, the anticipated budget deficit comes at 2.8% of GDP, according to the European Commission. In 2015, the projected budget deficit is 3.3% of GDP. Due to the loose fiscal policy, the Czech public debt quota grew rapidly in the last few years. After a public debt ratio of 29% in 2008, the figure grew to 50% of GDP until the end of 2013. In 2014, the Czech economy is forecasted to expand 1.8%. Next year, the economic growth rate will accelerate further, according to the European Commission. More and more foreigners seek paid health care services, mostly cosmetic surgery, surgical treatment of obesity and assisted reproduction, in the Czech Republic. Local health centres attract medical tourists from the UK, Germany, Austria and Russia as local clinics claim to charge half what the customers would pay at home for comparable treatment. Unofficial estimates from clinics put numbers up in 2013 compared to 2012, with the number of foreign clients attending Czech clinics more than doubling in the past few years. František Lambert of ISCARE clinic told local newspaper Pravo, “In 2013, we provided care for over 1.000 clients from Germany, mostly for cosmetic surgery and assisted reproduction, with some obesity surgery." One draw for couples seeking help to have children is that local legislation is less rigorous than other EU countries; allowing anonymous sperm and egg donation. Jaroslav Hulvert of ISCARE estimates that the total for local clinics was 4,000 to 5,000 couples seeking fertility treatment.